In silico techniques require exhaustive data and sophisticated, well-structured informatics tools to help scientists gain insight into crucial aspects of compound behavior, including potential off-target effects. The right research support solution can greatly streamline the process. Profiles generated using in silico methods have many advantages over more costly in vitro and in vivo techniques. For example, fewer molecules are synthesized and cell and animal use are reduced. Ultimately, predictive, targeted R&D enables faster experiments. Off-target effects result from a drug modulating targets other than the intended one. Knowing what effects a candidate compound might have is essential for well-informed drug development decisions. The early identification of possible off-target effects could help scientists select the best possible scaffolds for advancing through hit-to-lead and on to lead optimization. In silico compound profiling allows researchers to gain valuable information in order to plan and prioritize drug discovery and development programs. 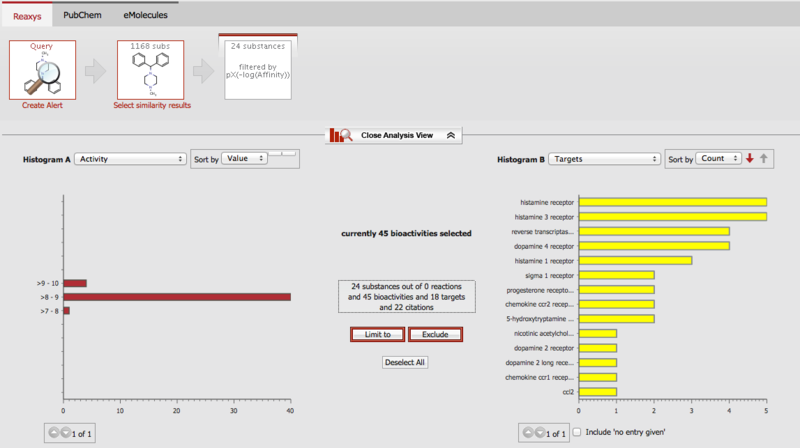 This tool is frequently used to investigate potential off-target effects. 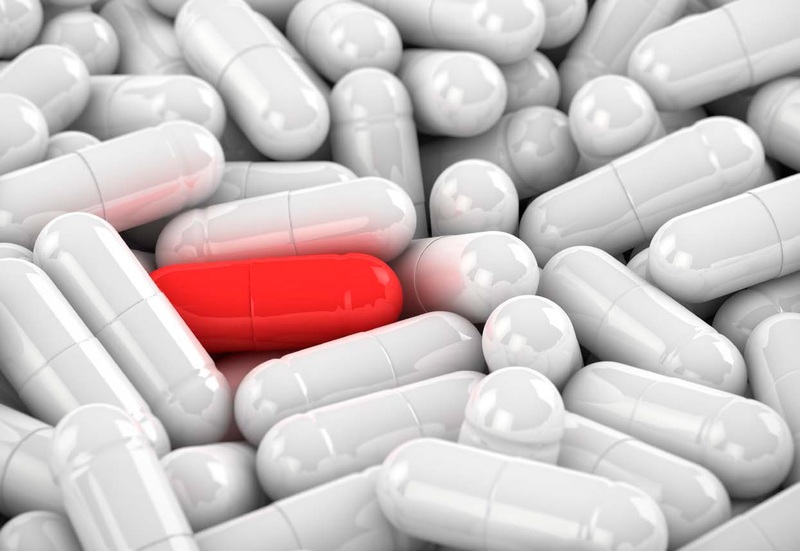 As part of the investigation into such effects, scientists will often compare profiles of compounds that are similar to a potential drug candidate in order to identify interactions. This whitepaper describes how such profiling can be performed efficiently with the data and analytical features of Reaxys® Medicinal Chemistry, using the example of a hypothetical hit structure to target the histamine H3 receptor. High-quality scientific data facilitates accurate global compound profiling. This is the best way to see how a molecule interacts in the pharmacological space and in later-stage ADME studies. These profiles help organizations plan and manage research programs. They can also alert scientists to potential off-target interactions or toxicity issues provide options for repurposing drugs; and enable more definitive and better-informed go/no-go decisions. In silico global compound profiling exploits in vitro and in vivo experimental information to produce a profile of properties for a given compound. It follows the same methodology as experimental profiling, in which a large set of compounds is screened for a particular activity and an active set is further pared down (or profiled) using specific parameters such as mechanism of action, selectivity and ADME characteristics. The Reaxys Medicinal Chemistry database is organized around compounds, targets and biological activities. Each element is described and organized into logical hierarchies according to experimental protocols appearing in the literature. Taken as a whole, the information compiled by Reaxys Medicinal Chemistry creates a global pharmacology space encompassing more than 447,000 literature sources, 12,700 targets and over 29 million biological activities. Filter retrieved data to exclude or limit certain data sets, focus on compounds or targets, or view a complete list of citations. 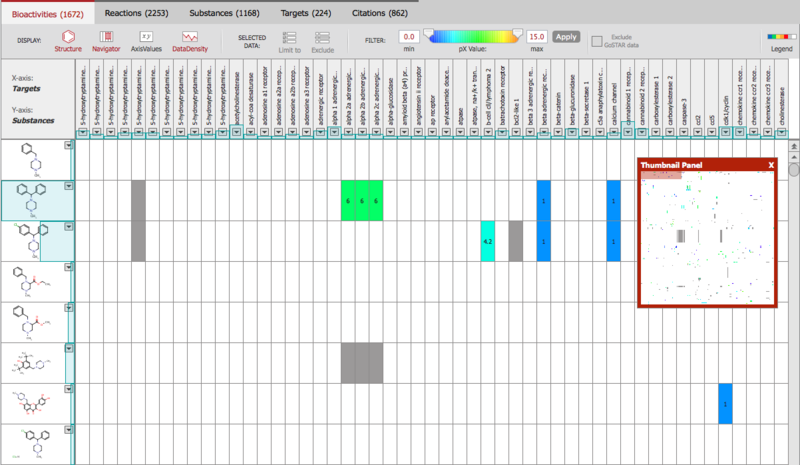 The interactive Heatmap displays compound–target data in a manner allowing the rapid visualization, navigation and filtering of results based on various parameters such as activity, species, bioassay protocols, publication type and standard target classification hierarchies. To facilitate comparisons of bioactivity data from different publications and assay types, all the data points in Reaxys Medicinal Chemistry have pX values, which are displayed and filtered through the Heatmap. They are calculated by transforming EC50, IC50, Ki, etc. into pEC50 = -LogEC50, pIC50= -LogIC50, pKi = -LogKi, etc. These are normalized values assigned to the data to enable straightforward quantification of compound–target affinity regardless of the origin of the data. 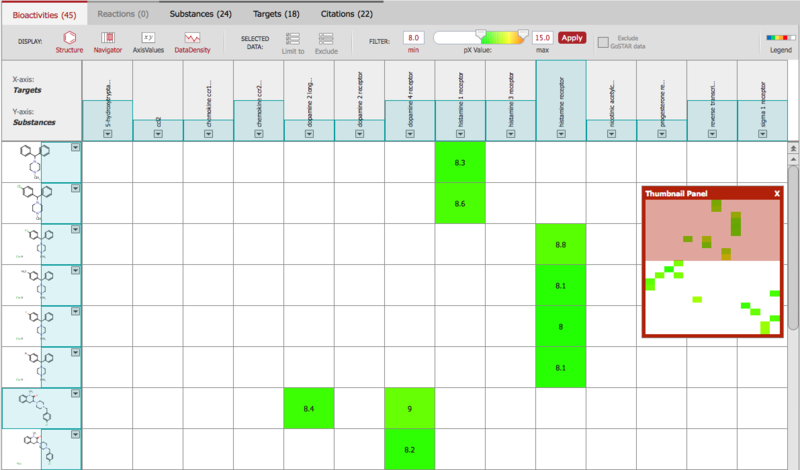 Reaxys Analysis View lets users select analysis criteria to get a sense of the relationships between results. The histograms can be set to various categories and will display the number of hits in the hitset that correspond to the two categories. This whitepaper focuses on the example of a hypothetical hit structure to target the histamine H3 receptor (Figure 1). To determine other possible targets with which this structure might interact, a chemical similarity search is necessary. Reaxys Medicinal Chemistry was used to retrieve the necessary data. Medium selectivity was chosen as this includes structures with a wider range of rings and substituents: the degree of unsaturation, form and substitution patterns of rings is extended (Figure 2A). On completing the chemical similarity search based on the hypothetical hit structure, 1,168 compounds were found. They are involved in 2,253 reactions, have 1,672 bioactivities associated with them and show activity against 224 targets. The data were extracted from 862 citations. The activity profile for all the structures that are similar to the hypothetical hit compound can be visualized using the Heatmap (Figure 2B). The pX values quantify the biological affinities and activities from 1 (low; in blue) to 15 (high; in red). The colors of the Heatmap cells represent the maximal pX retrieved for a given compound (line) against a given target (column). Grey cells indicate that qualitative data is available and the cell is white when there is no data. Figure 2. (A) Medium chemical similarity search on the hypothetical hit structure. (B) Heatmap displaying all chemically similar compounds for the hypothetical hit structure and the related pX values for associated targets. An activity profile for structures that are similar to the hypothetical compound with high potency (pX > 8.0) against their associated targets can easily be generated and visualized using a Heatmap (Figure 3). This type of analysis is essential to understand the risk of off-target effects at a potential active therapeutic dose. In this case, 22 similar substances with a pX above 8.0 (affinity < 10 nM) showed activity against 14 targets. Figure 3. Heatmap for compounds with similar structures to the hypothetical hit compound and pX activity above 8.0 (affinity < 10 nM). On further examination with Reaxys Analysis View, structures similar to the hypothetical hit compound are indeed found to be active on the desired target, namely the histamine receptors, in particular H1 and H3 (Figure 4A). The histamine receptors are part of the GPCR target family. Investigating which other GPCRs have highly potent binders similar to the hypothetical hit could identify potential selectivity issues early in the drug discovery program (Figure 4B). The 5-HT1A receptor, the dopamine receptors D2 and D4 and the chemokine receptors CCR1 and CCR2 are all indicated from the analysis as potential off-targets within the GPCR target family. In addition to the GPCR target family, there are similar structures to the hypothetical hit with high activity against the following targets: reverse transcriptase; the sigma 1 receptor; and the progesterone receptor (Figure 4B). These off-target interactions are associated with a broad range of effects, including those of antiretroviral drugs, antipsychotic medications and antiprogestins. An array of useful techniques for speeding up the drug discovery and development decision-making process lie where chemistry, biology and informatics converge. The most recent of these techniques is in silico global compound profiling. Armed with profiles that elucidate potential compound activities, mechanism of action, toxicities or ADME effects, researchers can plan, manage and conduct predictive discovery programs. Reaxys Medicinal Chemistry provides an extensive chemical and bioactivity database along with an intuitive interface for exploring this area. Reaxys Medicinal Chemistry provides scientists with multiple options to use and integrate the content into existing tools and in-house systems. Data can easily be exported for use in a number of popular modeling packages such as MOE (CCG), Small-Molecule Drug Discovery Suite (Schrodinger), Biovia (Dassault) and Chemaxon or integrated into in-house software with the Reaxys Medicinal Chemistry Flat File. The extensive Reaxys Medicinal Chemistry database can be used to conduct pharmacophoric similarity searches, chemical space analysis, structural analog searching, virtual screening and quantitative structure–activity or structure–property relationship (QSAR/QSPR) models.